Think You Know Beef? What About Seasonal Grass-Fed Beef? Shop often enough at the embarrassment of riches that makes up the Bay Area’s farmers’ market scene and you can’t help but start to get a sense of the seasons: fava beans and sugar snap peas in the spring, tomatoes in the late summer, hachiya persimmons for a few glorious weeks in the fall. But if you’re anything like me (assuming you eat meat), you probably think of beef as a year-round indulgence — one that’s restricted more by your cholesterol level or your bank account than by what month it happens to be. Not so, says Bill Niman, whose Bolinas-based company, BN Ranch, rolled out this year’s first shipments of one-hundred-percent grass-fed, seasonally-slaughtered beef earlier this month. It’s a project Niman says he’s been working on for about a decade, but many of the Bay Area’s eco-conscious, flavor-savvy diners are just now starting to wrap their heads around the concept. In the arena of sustainably-raised meat, there aren’t many names that command more respect than Niman’s. The company he founded in the 1970s, Niman Ranch, was built on the simple principle that meat raised in a humane and natural manner will also taste better. No longer solely the purview of the Chez Panisses of the world, the Niman Ranch brand name now gets flaunted — a kind of we-use-good-meat stamp of approval — even at mom-and-pop burger joints and taco shops. Of course, in 2007 Niman famously split from the company and later stated that he no longer eats Niman Ranch products, questioning the new owners’ compliance to some of the strict protocols he’d established. Since then, Niman’s mostly stayed under the radar, though he didn’t wait long before starting BN Ranch, selling mostly pasture-raised goats and turkeys at first. Five years ago he started selling a small quantity of seasonal beef — just to Chez Panisse, basically — but he’s been slowly expanding the operation ever since. “I wouldn’t buy a tomato in January, and I wouldn’t buy strawberries in January,” Niman told me. By that same logic, he says, he wouldn’t buy grass-fed beef in Northern California if the cattle had been slaughtered in February or March. According to Niman, the key is understanding that the process of raising healthy, well-marbled beef is closely tied to the seasonality of grasses. When grasses are mature — when they have fully-formed seeds — they become carbohydrates. Consequently, it’s as though the cattle are eating pasta for two months of the year, after ten months of eating tofu, Niman explained. Those carbohydrates get turned into intermuscular fat — marbling, in other words — and that’s what makes beef delicious. Once you get into November, the cattle are no longer fattening up — like bears in hibernation, the cattle’s bodies start to consume all of that fat. “The idea that you can kill grass-fed beef in December, January, February, March — it’s not possible, in my opinion,” Niman said. Historically, beef producers have gotten around this problem by bringing the cattle into big feedlots in the months leading up to slaughter, fattening the animals up with corn or other grains to keep the quality of the meat high. In the post-World War II era, Americans have gotten used to eating this “grain-finished” beef. Consequently, even though wholly-grass-fed beef has gotten positive attention for its health benefits and its environmental impact — dispensing of the need to plow millions of acres of topsoil to supply enough corn to feed all the cattle — it has also gotten a bad rap in some corners, flavor-wise. Often, you’ll hear complaints that grass-fed beef tastes gamey or “grassy,” or that it’s too lean. Niman says that, quite frankly, that’s because a lot of the people raising grass-fed beef aren't doing it properly. And the slaughtering of cattle during the winter months, when the animals are in poor condition, is a big part of the problem. According to Niman, at any given geographic location there’s only a window of a few weeks’ time when the cattle will be at their peak — when they’ll have the best flavor and the best marbling. In California, however, Niman can extend that season by moving his cattle — mostly of the Black Angus breed — in pursuit of the good green grass, starting in the Sierras, moving out west, and then heading up into the high country. At most, the season can stretch from May to November. It’s a costly, labor-intensive process, though Niman says his prices are comparable to other grass-fed beef. Once slaughtered, the carcasses are broken down by hand by a team led by Oscar Yedra, Niman’s longtime butcher, at a facility in Santa Rosa. Yedra, for his part, says the seasonally-slaughtered beef is actually easier to work with. It lacks the cover of fat you get with corn-finished beef, and also isn’t too lean as is the case with a lot of grass-fed beef. “It’s just right,” Yedra said. Of course the proof is in the pudding, and diners can decide for themselves if Niman’s beef is as good as he says. Fortunately, this year there are more East Bay vendors than ever that are selling BN Ranch’s seasonal grass-fed beef, and it isn’t just high-end places like Chez Panisse. Berkeley’s Cafe Rouge is selling Niman's beef at both the restaurant and its on-site meat market. The restaurant often has BN Ranch steaks listed on its specials menu — as of this posting, the current online menu lists a “BN Ranch top sirloin brochette.” According to Chuck Traugott, the head butcher at the meat market, BN Ranch beef is the only one-hundred-percent grass-fed beef available at Cafe Rouge — and they’ve stopped carrying grass-fed beef out of season. Saul’s Deli now uses BN Ranch beef for all of its hot dogs, burgers, and roast beef. If you’re lucky, you might even stumble onto a batch of house-smoked pastrami made with BN Ranch navel — a cut available in too-limited quantities for the restaurant to use all the time. And at the certified-green restaurant Sunny Side Cafe — with locations in Albany and right near the UC Berkeley campus — chef Aaron French is using BN Ranch ground beef for all of his burgers, and other cuts in his weekly brunch specials. 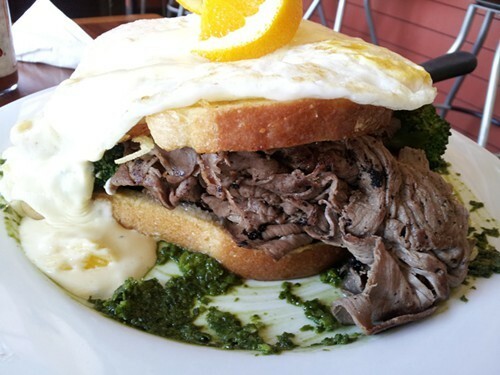 Last week he ran a roast beef variation on his signature savory French toast sandwich, the Alameda, that used BN Ranch sirloin roast. This weekend he’ll have BN Ranch beef in an eggs benedict special. Finally, for home cooks, Baron’s Meats & Poultry, in Alameda, is carrying BN Ranch beef for the first time this year — various cuts that include ground beef, stew meat, roasts, and a variety of steaks. And The Pasta Shop is also selling BN Ranch roast beef. If you haven’t tried seasonal grass-fed beef, the next couple of weeks would be a good time to check it out: BN Ranch will do a kill every two weeks throughout the season (about twenty heads of cattle each time), and Niman says the meat hitting the shelves in early July will be the best of the best, in terms of marbling and maturity. And if you have tried BN Ranch's grass-fed beef, leave a note in the comments — I’d love to hear what you thought of it, especially in comparison to other grass-fed beef.